Mort Subite is known for their fruit lambics, and many have turned up in bottle shops in the Pacific Northwest instead of on draft only. 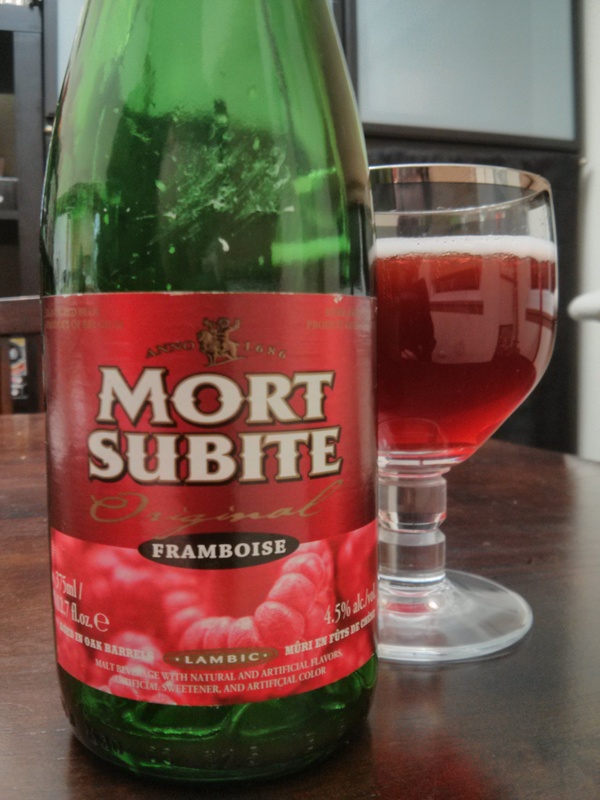 On Day 10 of our Beer Advent we opened up a bottle of Mort Subite Framboise, their raspberry lambic. Framboise poured a ruby color with a slight haziness to it, not crystal clear. The bottle had a nice carbonation to it once opened and poured a frothy white head which did not stick around for much longer. The aroma of the beer is mainly raspberries, but more of the artificial type. The initial taste packs a sweet bite, but it also has the dryness like many hard ciders. You will taste mainly just raspberries and sugar with this beer, there is not much in the way of malts, grains, nor hops. Mort Subite Framboise, and their Kriek, is a great gateway lambic beer for those with a sweet-tooth looking to get into craft beer, or those who might prefer sweeter wines and wish to imbibe in a beer. It is a vastly different style than say a hoppy IPA or a malty Doppelbock, but it is refreshing during those hot Summer days.